I searched for “Nashville Auto Insurance” both logged into Chrome and from an Incognito browser. After clicking on the first result, the Local Finder Organic listings were different. 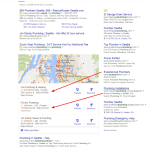 The first 2 Organic results were the same but the Incognito browser (right side) had another listing from Manta followed by YP and the WhitePages. My logged in browser displayed a YP listing, a competitor and then WhitePages. 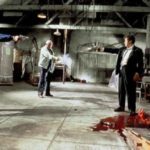 I tested this for several markets and several industries. Nearly all of the time there was no discrepancy between being logged in and being in Incognito. The particular listing above with Nashville Auto Insurance was an exception. Where is Google pulling the Organic results from? If you simply Google the business name, the results are similar, but not completely the same. Usually, 67% of the listings are the same. I even performed several site:domain searches, both logged in and Incognito, to see if those matched up more evenly. The results of those were nearly the same as searching the Business Name. Apex Plumbing had 4 of the same Organic results simply searching the business name. This site search of a Chicago B&B shows a similar result to the ones posted above without a site search. Others I tested also performed similarly with a site search. It is difficult to determine where G is pulling the Organic listings from in the Local Finder. There are some similarities when doing a “site:domain” search but its not 100% accurate. A business name search proved similar results but is also not 100% the same. 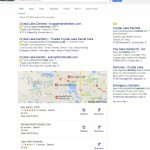 Perhaps these new Organic listings in the Local Finder perform similar to Organic listings in the SERPs and they will never be 100% the same no matter who is searching from where. UPDATE: As Joy Hawkins expertly figured out, it appears G is pulling results based on the query: Business Name, City, State. 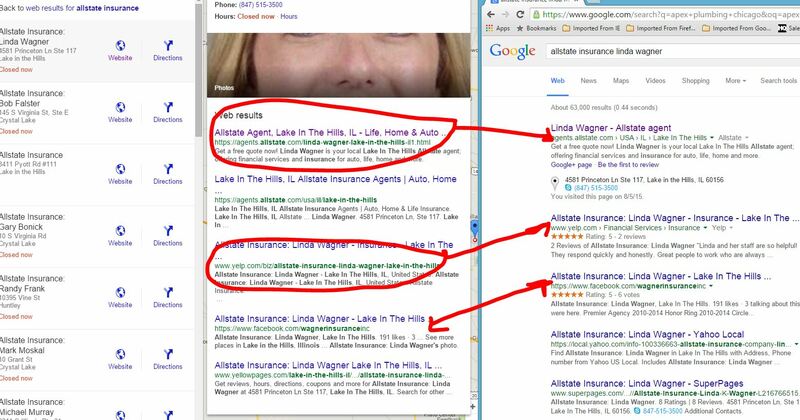 In the Linda Wagner example, you can see the string – https://www.google.com/search?q=Allstate%20Insurance%3A%20Linda%20Wagner%20Lake%20in%20the%20Hills%2C%20IL. The source code shows the same: Business Name%City%State. Great pick up by Joy! UPDATE: Jen Slegg has a terrific write up about this as well. Stop by and give it a read.